Space weather is caused by interaction of particles and radiation coming from the Sun with Earth’s enviroment (Credits: Eurocontrol). The eruptions of the infamous Icelandic volcanoes Eyjafjallajökull and Grímsvötn, in 2010 and 2011 respectively, caused disruption of the air traffic over Europe resulting in a huge financial loss. The events showed the necessity of measures for Europe to effectively react when other similar crises affecting air traffic arise. Space weather is one of the phenomena that can trouble aviation, possibly causing emergency situations. The European Aviation Safety Agency (EASA) and Eurocontrol, the European Organization for the Safety of Air Navigation that coordinates air traffic control for all Europe, organized a workshop on March 20 in Cologne to specifically address the effects of the space water on aviation and find an appropriate response. Space weather refers to perturbations in Earth’s magnetosphere, ionosphere, and thermosphere coming from the Sun and solar wind. However, solar activity is not constant and sometimes eruptions on the Sun’s surface result in an abnormal elevation of radiation and particle ejection. If directed towards our planet, these radiation and ejected particles could affect communications, electronics, and human health. The occurrence and severity of these eruptions follows an 11-year cycle composed of a period during which the severity and probability of occurrence of eruptions are low, followed by a higher solar activity period. Cycles have been characterized using the sunspot number since 1749. The peak of the present 11-year sunspot cycle,or Solar Max, is supposed to take place in 2013, however so far the solar activity has been relatively low. Unfortunately, solar activity is difficult to predict and although there are instruments investigating and monitoring the Sun both in space and on the ground, warning time ranges between 8 and 30 minutes for radiation and energetic particles to a few days for ionized plasma. Space weather can affect aviation causing degradation of radio/satellite communication, onboard system failure, radiation doses for air travelers, and disturbance in GNSS radio signal. In severe instances it can induce power grid and ground public communication failure as well as satellite failure. A geomagnetic storm caused the collapse of the entire Quebec power grid for 9 hours, on March 13, 1989. The US Wide Area Augmentation System, which is an air navigation aid to improve GPS accuracy, was unavailable for almost 9 hours due to an ionospheric storm in October 2003. A solar flare, which is a colossal and energetic coronal ejection from the sun, severely impacted all HF communications over the US, on September 7, 2005. It has been estimated that more than 12 satellites have been lost to causes clearly ascribable to space weather. 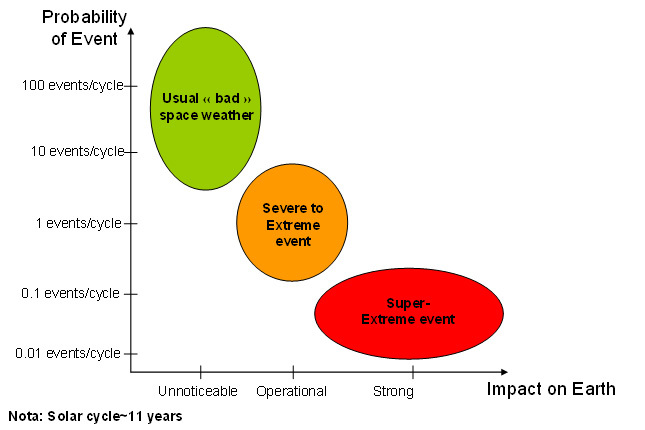 Probability of space weather events versus impact on Earth (Credits: Eurocontrol). Although the impact has been limited until now, it has to be considered that since the development of applications that rely on electronics and communications to work, Earth has never undergone a “Super-Extreme event.” The most recent of these events was recorded in 1859. According to Emilien Robert, Space Weather & Navigation Application Expert at Eurocontrol, “50% of space vehicles may be lost in a super extreme event.” Although, these events are very rare and may happen only once every 100 to 500 years, they could bring the world back to ‘60s level technological capability, with impossible-to-quantify damages to the worldwide economy. To prevent at least some effects of space weather, aircraft should maintain a back-up to satellite communication and navigation and air traffic control centers should have alternate power generation in case of power failure to ensure the safety of air navigation. Currently, airlines do not fly polar routes when a radiation storm is in progress to reduce radiation dose and risk for aircraft. Both operators and pilots, represented by United Airlines and European Cockpit Association, highlighted the need of a space weather forecasts. The forecast information should be standardized and contain precise indications about the space weather phenomenon, the validity, and the area of effects in a way that operators and pilots can make a decision in a short amount of time on whether or not to modify the flight plan. Moreover, pilots need training to be able to use procedures, information, and guidelines that already exist. The workshop highlighted the need to spread awareness of space weather’s effects on aviation outside the community and at the same time to improve how the information are provided to the final users: aircraft carriers, pilots, and airports. Space weather forecasts need to become actual forecasts instead of just warnings when solar events are happening. It necessary to promote space weather science and research to fill existing knowledge gaps to achieve such forecast capability. To remain up-to-date with current space weather, check the Space Weather Service Network from the ESA Space Situational Awareness Preparatory Program.